Click here to jump to the recipe! First let me say this, I can not even begin to thank you all for the love, prayers, messages, and emails. I was super nervous about this and your messages before and after provided so much comfort. I knew with all these amazing folks sending prayers up, there was no way something could go wrong. I had intended to keep the details of what was going on quiet, just because I didn’t it want to sound like I was whining and it’s not something I’d discuss in polite company. But I’ve had so many folks ask and y’all are more like family, so…. here’s a run down. I seriously can’t thank y’all enough for the comments, posts, emails, calls, and messages. I think there were more than 1,000 in one day. Y’all just don’t know how much it means to me. The morning of the surgery had me super nervous, but reading those on the way to the hospital gave me the most amazing peace about it all. I love and appreciate y’all, more than any of you could ever know. Now… should we talk about this food?? Y’all, this dish is absolutely delicious! 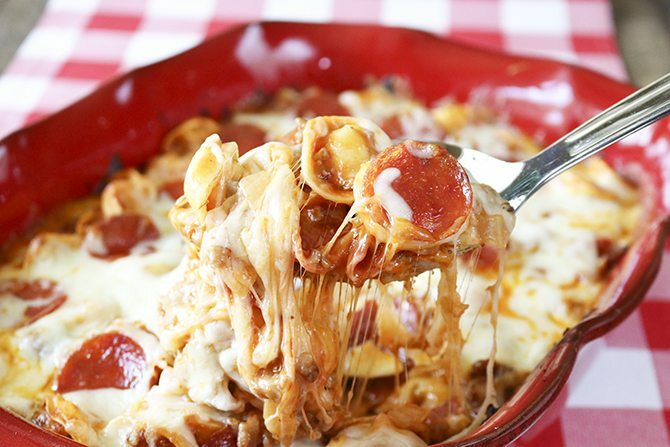 It’s gooey, cheesy perfection. I ate it 3 times in a row. I just know your whole family will love it. And the best part is it reheats even better, like so many dishes like this. 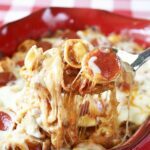 I took my Mom’s classic recipe for Pizza Casserole and just switched a few things up to turn it into this Baked Pizza Tortellini. You can even make it your own by adding in other of your favorite pizza toppings: Mushrooms, black olives, green peppers, Canadian bacon… the options are endless! Preheat the oven to 350° and lightly spray a 13x9" baking dish with nonstick cooking spray. In a large skillet over medium heat , brown the sausage with the onions until it is cooked through and no longer pink. Add the garlic and cook for 2 minutes. Drain away the grease. 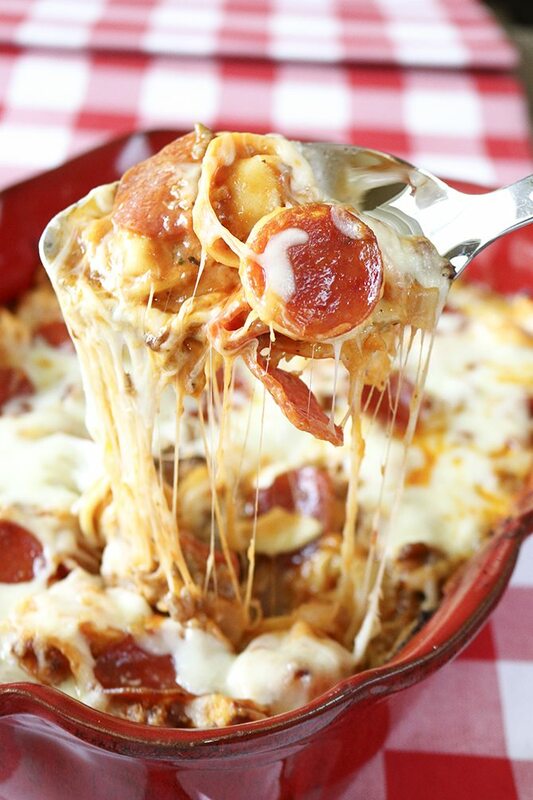 In a large bowl, combine the uncooked tortellini, pizza sauce, cheddar cheese soup, italian sausage with onions and garlic, about 3.4 of the pepperoni, salt, and half of the cheese. Stir to combine. Pour the mixture in the prepared dish and top with the remaining cheese. Add leftover pepperoni and other pizza toppings if you desire. Olives, mushrooms, green peppers, and Canadian bacon also make great toppings. Bake for 20 to 25 minutes, or until the casserole is bubbly and the cheese is melted. So glad you are feeling better! I love your postings. They keep me out of a rut in the kitchen . Prayers for the rest of your recovery! Thanks so much, Stephanie! You’re so sweet to say that. This recipe looks so good, I can’t wait to try it! So glad you’re feeling better and on the mend! I am so happy to hear you are feeling so much better!!! 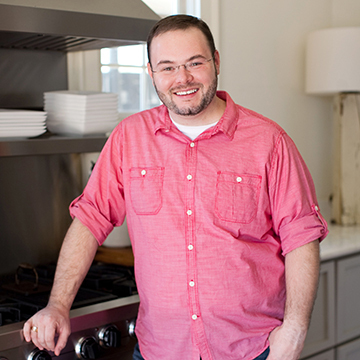 I love your blog and all the wonderful recipes!! This one looks so good!! Can’t wait to make it!!! Thanks, Brenda! I sure hope you’ll enjoy it!! So glad you shared your story with us. Happy to hear you are on the mend. I’m sure You will be 100 percent again in no time. Prayer works! God is so good to us. He is always there! Yes it does, Diane! And I am so blessed to have had so many of y’all praying for me! So glad you’re back (hopefully) to normal! Wishing you a speedy recovery! Delighted that you are feeling better! 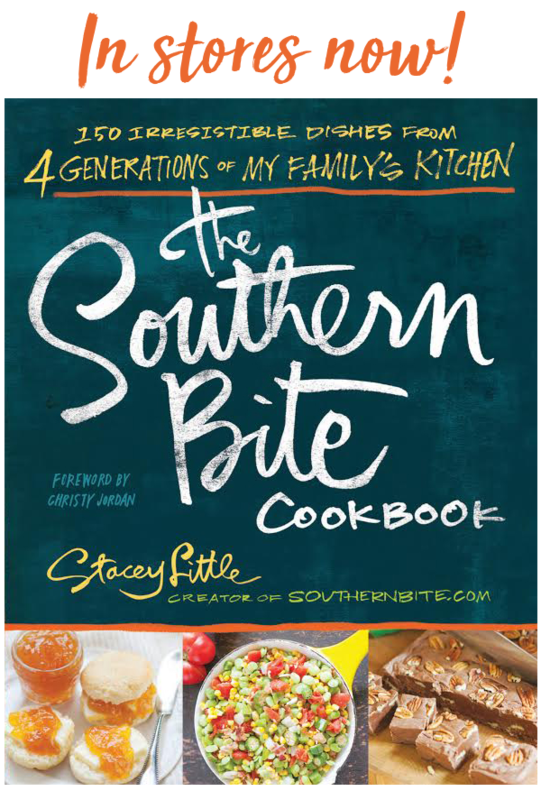 Follow Doctor’s orders and keep up the good things on Southern Bite – love it! Wishing you all the best!Wish I had read about your problem.My entire colon was removed,many years ago,after years of illness.Even had a 10 year nightmare of a unnecessary ileostomy ! ?So,I know how difficult G.I.issues can be! Am a total foodie,and make food for my gang that I often am unable to eat.Still brings me joy to just be able to get in my kitchen after years of surgeries,recovering,bedridden off and on…Godspeed my friend,and take it slow.Wishing you and your family well?. Thanks so much, Teri! Sorry to hear about your battle, though. God bless your sweet heart, Stacey. My heart goes out to you and to anyone that suffers through these painful events that make you think you have left-sided appendicitis! I know the pain of diverticulitis all too well. Never had an episode with it until my gallbladder was removed and had to deal with diarrhea for over 3 months. That stuff is not a friend to people with diverticula pockets. I, like you, had no idea what was going on to begin with, but eventually I could feel the area pulsate with pain every time my heart would beat. I’m so glad you had the offending area removed and won’t have the threat of this repeating. suffering and $$$. I learned this technique from a retired Doctor that has diverticulosis. He VERY gingerly presses down & shakes, with his fingers & hands, all the way down the left side of his abdomen (paying more attention to a suspect area) each morning before getting out of bed when he starts to detect a sore spot in the ascending colon area. He also does this just as soon as he notices the soreness too. The point of this is to shake the offending….well, uh….”stuff” out of the pocket before it has a chance to swell and close off the escape route. I have successfully done this 3 times when I felt a spot getting sore when leaning against the countertop at the kitchen sink or while in the tub. I hope others are as successful as I have been since learning this. Thanks so much for sharing, Linda! I sure appreciate your kind words. I am glad that you are on the road to recovery! What a journey! That must have been very painful! I would never go straight to the recipes. I love your stories that you share. Thanks, Pam! You’re so sweet to say that. I’m sorry to hear you’ve been feeling badly. Hope you feel better soon! I enjoy your website very much! Thanks, Kate! I’m getting better every day! Bless your heart and I hope that all is well with you now. I have known of only 2 people that have had it and from what they’ve said, it is horribly painful. I’m so glad to hear that everything is fine now. I bet your little nurses at home are taking great care of you. 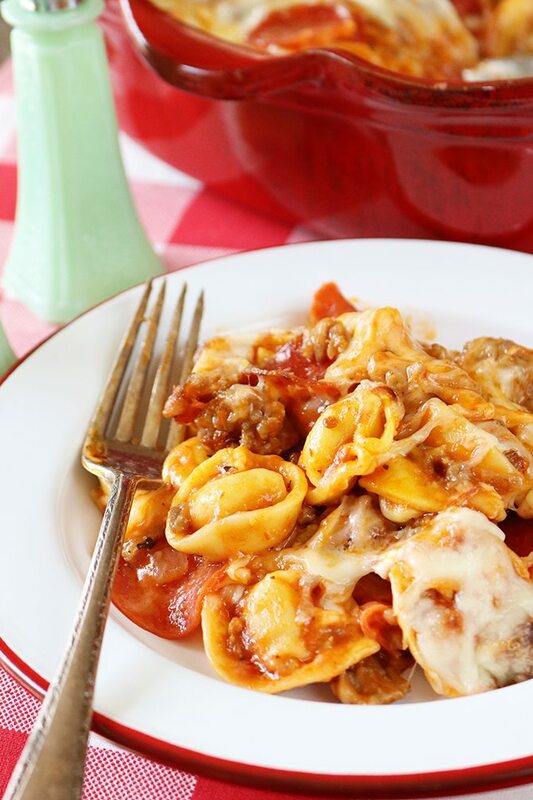 🙂 Take it easy in your recovery and thank you for supper tonight with this delicious Baked Pizza Tortellini! Thanks, Denise! Sure glad you enjoyed the tortellini!! Wonderful! Love hearing that! Glad y’all enjoyed it! Just discovered this recipe, Stacey, and definitely will have to make it soon. Just one question. There are only 2 of us in this household (my son is an adult) so I’d like to halve it. Is it possible to freeze half the can of the condensed cheese soup? P.S. Had considered baking the whole dish and freezing half but I NEVER have adequate freezer space. I’m honestly not sure. That’s not something I have much experience with, but honestly, I don’t think it would be a problem. This may be a silly question, but do you put the tortellini in the baking dish still frozen? Yep, it should work out just fine if they’re still frozen. I am not sure how I wandered upon this recipe…..but now that I’ve found your site I’ll be a frequent visitor. We loved this. Cheesy and delicious! I made as posted this time, but I’d like to add some of the other toppings in the future…..at least to half of it so I can keep the rest of the family happy. Thanks for the post!